(Paul Seaburn) It happened in Iowa early in the campaign for the Republican presidential nomination and now it’s happened again, this time on the day before the winner of that nomination and the election was inaugurated as president. 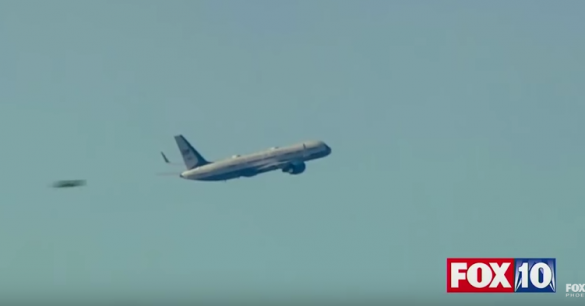 A video of then president-elect Donald Trump’s “official government plane” (not his personal plane and not Air Force One) leaving New York on January 19th to travel to Washington DC for the inauguration and festivities shows what appears to be two UFOs. What could they be? Was the soon-to-be-president aware of them? Did they influence part of his inaugural address? We stand at the birth of a new millennium, ready to unlock the mysteries of space, to free the earth from the miseries of disease and to harness the energies, industries, and technologies of tomorrow. The video was shown on the FOX 10 Phoenix channel in Arizona. 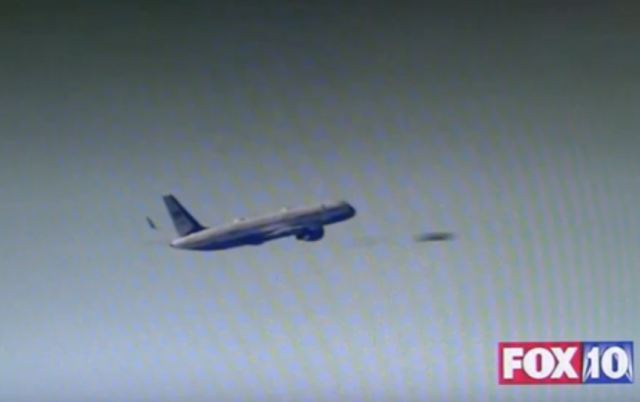 The UFOs – one at 1:50 in the video and the other at 2:55 – were spotted by many people, including a witness who reported it on the MUFON web site (case 81655). 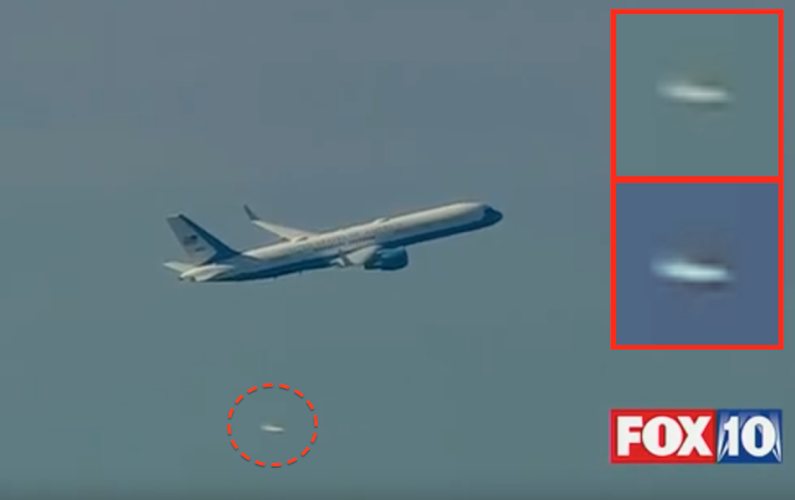 Spotted two different objects while viewing a video of Mr. Trump’s flight to the White House. Saw a white saucer shape object. Then later near the end of the video and black square one. I took photos off my pc to show my UFO group. The objects appear to be different – one white and one black – and are suitably blurry enough to defy accurate identification. Popular speculation beyond aliens monitoring the president-elect is that the first is a plane or drone and the second looks suspiciously like a bug or bird passing in front of the lens. This is not the first time a UFO has been seen near an aircraft with Donald Trump on board. 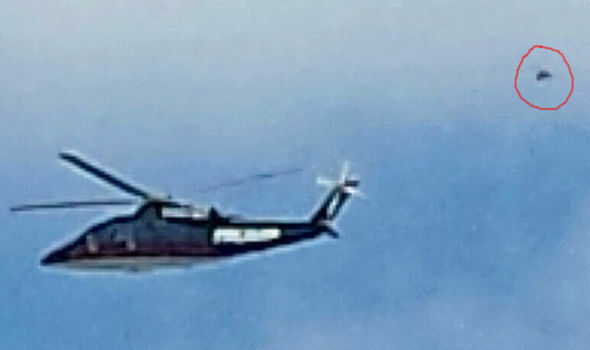 Photographers captured a UFO behind Trump’s personal helicopter while leaving the Iowa State Fair in March 2016. At about the same time, UFOs were spotted over Russian President Vladimir Putin’s hometown of St. Petersburg, a city that has had its share of UFO sightings. Hillary Clinton and her campaign manager, John Podesta, promised to open the secret government files on UFOs and aliens if they won the election. Last week, the CIA declassified and released 13 million pages of documents, many containing reports of UFO sightings, as one of its last acts under the Obama administration. President Trump is certain to be the most photographed and videoed president in history and those images will be studied with intense scrutiny. In these tense times, his plane and the airspace over wherever he is on the ground will be protected by the most powerful and possibly most secret military aircraft ever. And yet … will jets, drones, birds or bugs be able to explain every UFO seen around him?